This small change lets you position and display subtotals more exactly, but to reproduce it you first have to have a matrix containing them. 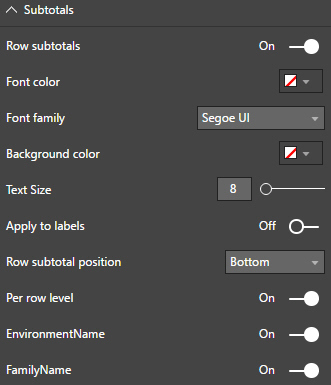 Although there are two row titles, only one will display by default. Click as shown to show both row titles together. You can now see subtotals! 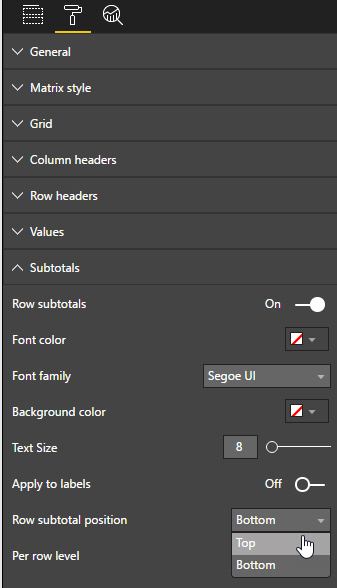 You can choose to display subtotals at the bottom of each section (the default) or the top. 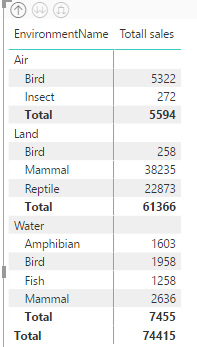 You can see the total sales for each environment next to the name. 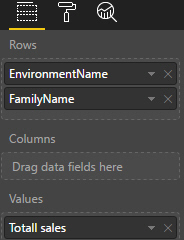 Set the Per row level property to choose for which fields to display subtotals (here for both the EnvironmentName and the FamilyName fields). For a matrix with only two row or two column fields, you won't see much difference. 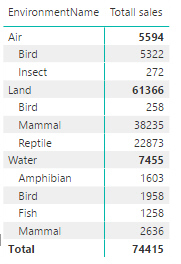 You can do a similar thing to column subtotals - the only difference is that the property above is called Per column level, not Per row level.